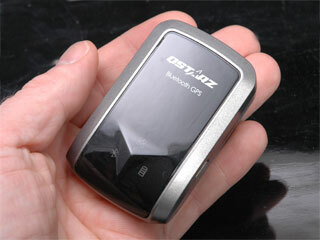 Qstarz claim that the new 32 channel GPS receiver an provide navigation for 32 hours thus the "Double 32" naming. Based on a relatively new MTK GPS chipset the low power consumption enables the extended operating time. Since about a year ago Bluetooth GPS devices stopped being functional black boxes and a certain element of design came in. These early 'stylish' GPS receivers looked good, but were lacking in other areas. The Qstarz BT-Q818 has certainly addressed that issue. Qstarz claim to have squeezed an operation time of 32 hours, yes THIRTY TWO, from their latest receiver. This is achieved using a standard 1100mah battery so it is not because of a huge power source. 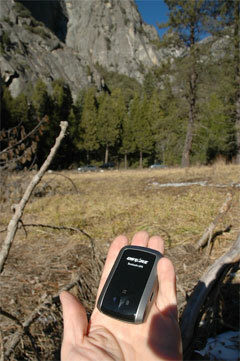 The device is not the smallest of GPS receivers, but neither is it overly large. This just leaves the use of the new MTK GPS chipset and the integration with the other circuitry as the reason for this extraordinary performance. Qstarz are branding the BT-Q818 GPS as the Double 32: 32 Channels and 32 hours. The 32 channels is a little superfluous as there are only 24 GPS satellites, plus a few spares and some WAAS/SBAS birds, but only a limited number (up to 12) can be viewed and tracked at any one time. Each satellite that is tracked uses a single channel, therefore realistically you only need a maximum of 13. A lot of fuss is made about chipsets, and rightly so. The acknowledged market leader is SiRF, with the SiRFStarIII the benchmark for all other chipsets. MTK are not one of the best known manufacturers and this is, to my knowledge, the first commercial receiver using the chips. The Qstarz 818 is a reasonably small device, and whilst not the smallest or lightest it fits comfortably in the palm of your hand. It has a two tone casing design with the indicator LEDs located in a raised pyramid on the front of the GPS. On the right hand side of the GPS receiver is the power connector. 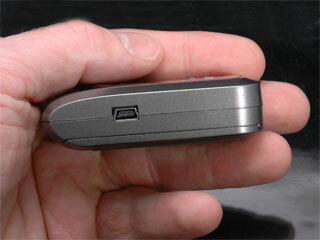 This is a standard mini USB connector. This connector is great as it means that I can recharge the device using my laptop, and it is the same connector as my PDA and mobile phone, meaning I only need to take a single charger with me on my travels. Note that the mini USB is for charging only and not for positional data, you need to use the Bluetooth connection for navigating. On the left side of the receiver is a physical on-off switch. The GPS runs on full power when connected via Bluetooth, but when the connection has been broken the system switches off most of the functions and just waits for a device to reconnect before powering up again. This also works well when you are driving and making lots of stops. You can leave the GPS in a secure place and take your PDA with you when you stop. When you return to the car your PDA will automatically wake up the GPS and navigation can continue. 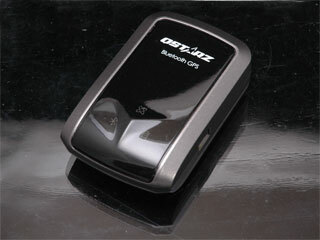 The base of the Qstarz BT-Q818 is covered with a non-slip rubber material. This is extremely effective at preventing the device from sliding around on your dashboard. As the entire base is made of rubber it offers a greater surface for friction and stability. 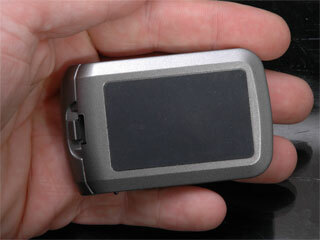 The overall appearance and feel of the GPS receiver is very good. 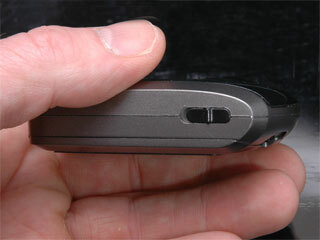 It handles well, the hard plastic casing resists marks and scratches. I did think that careless handling had left some nasty marks on the shiny black fascia, but a few seconds with a slightly damp cloth and they had disappeared. The final thing to look at is the powerhouse. 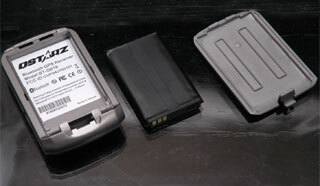 The small catch on the front edge of the GPS receiver opens up the battery compartment. Sitting inside is an 1100Mah Lithium-ion rechargeable battery. I was a little surprised to see this standard sized battery in the compartment, given the claim of 32 hours of operation, I was expecting a battery somewhat larger. Also supplied was a mains adapter, and a car cigar lighter. Both have a mini USB connector and are suitable for other devices as well. The Qstarz BT-Q818 GPS in use. I received the GPS receiver early January, and have done quite a bit of traveling since then. 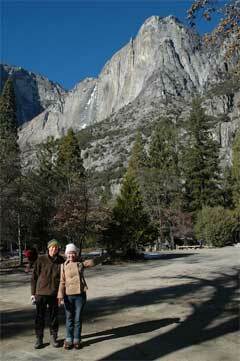 Each time I have taken the Qstarz BT-Q818 GPS with me. Getting started with the device was simple. I just powered it up, then paired it with my O2 XDA Orbit. Yes, I know the Orbit has it's own integrated GPS, but I was testing... After keying in the '0000' pairing code and creating a serial port I was ready to start navigating. Both TomTom and Memory-Map both recognised the GPS and started plotting my position pretty much instantly. I had the option of connecting it to either Com6 or Com7 on the Orbit, this left me a port free for another GPS receiver. The image to the right shows me traveling at 150MPH!! Yes really 150MPH, on the Eurostar from Paris to Ashford. The signal levels taken whilst in the train traveling through the French countryside. Sorry officer 150MPH is legal!!! The first trip I took was actually over to the USA for CES in Las Vegas. Once we were up in the air Virgin allowed me to use my electronic equipment including Bluetooth GPS. I decided rather than connect to my Orbit I would connect to a PC. I just happened to have my Sony UX with me and I started up Memory-Map and connected to the Qstarz 818. After a couple of minutes the GPS had managed to get a fix and was tracking our position. Unfortunately the internal SiRFStarIII GPS of the O2 XDA Orbit was unable to obtain a fix. After about 30 minutes of messing around I gave up and just played around with the Sony UX and the Qstarz. This was something I did notice quite a lot whilst I was testing. I appreciate that the circumstances were a little unfair in the plane, but once each receiver has a fix they should have similar time to first fix when switching between the devices. I found that the Qstarz had a quicker startup time than both the Orbit's internal SiRFStarIII chipset or a SiRFStarIII bluetooth receiver. Not only did the Qstarz receiver get a faster fix, but it also managed to pull in signals from more GPS satellites and get consistently stronger signal too. At first I was a little wary of this as I had experience in the past of software enhanced positioning, which at best was inaccurate. The Qstarz showed no sign of these inaccuracies and always seemed to be using 2 or 3 more satellites than the SiRF devices. I had a short excursion into the mountains to go skiing at the Las Vegas Ski Centre about 55 miles outside the city, a combined journey time of about 2 and a half hours. Not that this really stretched the device. As I was using public transport for the convention I didn't use it much in Las Vegas. Although I didn't use the GPS constantly I didn't need to recharge the receiver throughout the weekend. 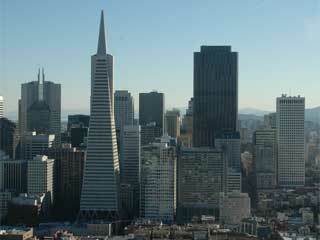 On our return from Yosemite we visited San Francisco this was a slightly different test ground. 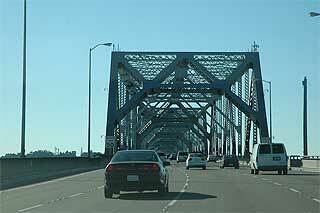 Traveling into the city we were on the upper deck of the Bay Bridge, all that was between us was a mass of girders, which didn't block the GPS signal at all. Once over the bridge we went straight into the Downtown area with lots of "skyscrapers" here we did have some problems as the GPS signal was bounced around a lot causing "Multipath" errors. There is not a lot that can be done about this and there were a couple of times when we were reported as being on the wrong road. Returning we took the Bay bridge again, but this time we were on the lower deck. Not a problem for the Qstarz as it retained a fix all the way. I have since used the GPS for 3 day weekend trip to Paris, France using it constantly without having to recharge it. In fact the tests I normally do for battery life have all failed because the Qstarz outlasts the test applications. I did manage to get the test app to last just over 26 hours once, and then the PC crashed. This meant that the GPS went into standby mode, I then used it for a few hours more and it still didn't need to be charged. Heading into San Francisco on the Bay Bridge. I am always somewhat wary of new technologies being introduced with claims of better this or more of that, but in the case of the Qstarz BT-Q818 they seem to have kept pretty quiet about the apparent strengths of the MTK chipset. A lot has been made of the 32 hours of operation from a single charge, but what seems to have passed un-noticed is the fact that this receiver really gives SiRF some competition. In my (non-scientific) testing I found this implementation of the MTK GPS chipset to be superior to the SiRF based systems I was using, both in speed to fix and also in the strength and sensitivity of the fix. The battery life is really impressive, but possible more important to me was the power saving features, like going into standby mode when the bluetooth signal was lost. This allowed me to have the receiver in the car and walk away with my PDA, the GPS shut down and then woke up again when I returned. I couldn't really find any negative points during my testing which is a little irritating. 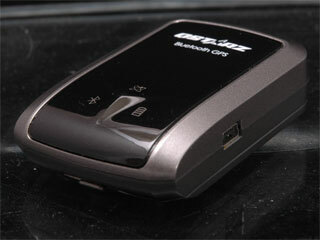 The Qstarz BT-Q818 GPS ticks all my boxes and is a receiver I would recommend for any application.